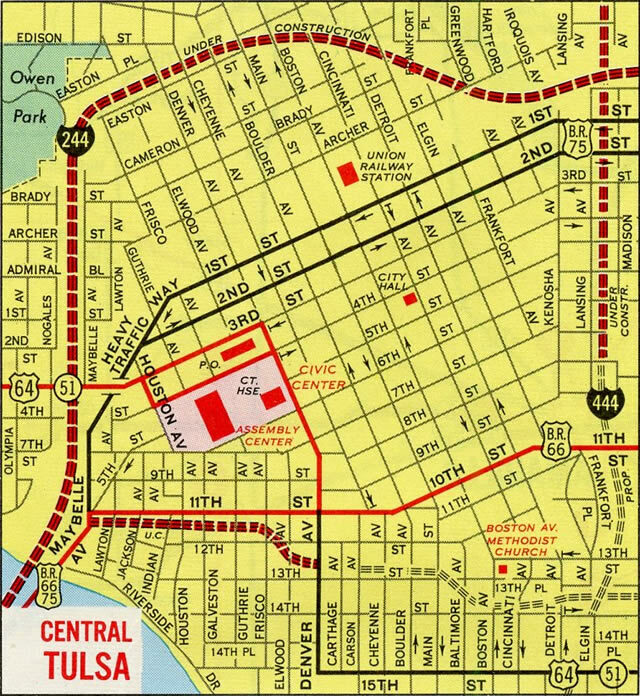 Interstate 444 forms the eastern and southern leg of the Inner Dispersal Loop (IDL) in central Tulsa. The urban loop is unsigned as it shares alignments with U.S. 75 throughout and U.S. 64 & Oklahoma 51 on the east-west portion. Despite the unsigned status, the route may appear on some maps or GPS units. 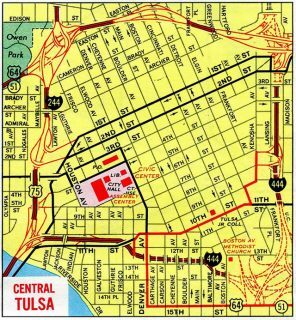 The initial stretches of the IDL were constructed at the same time Interstate 244 was around the north and west sides of Downtown Tulsa. Interstate 444 (IDL) opened as spurs from I-244 & U.S. 75 east to 10th Street and from I-244 south to 7th and 8th Streets. Interstate 444 shielding was removed by 1995 per ODOT in an effort to ease motorist confusion between I-444 and signs for I-44 and I-244.3 Photos taken through Tulsa by long time site contributor Cary Todd in 1994 showed no signs of Interstate 444 however. The overlaps with U.S. 64, 75 and SH 51 likely played a significant role in the removal of I-444 as well. This was not without precedent, as MDOT removed signs along I-296 in Grand Rapids, Michigan because of confusion involving the concurrency with U.S. 131. The IDL drops below grade from the directional T interchange with 7th & 8th Streets at 4th Street on the approach to Interstate 244 & U.S. 412 (Martin Luther King, Jr. Expressway) and the Cherokee Expressway north. Photo taken 05/05/12. A railroad line and two on-ramps pass over the transition of U.S. 75 from the IDL to the Cherokee Expressway as an unnumbered exit departs for I-244 & U.S. 412 east to Catoosa, Fair Oaks and Joplin, Missouri. Photo taken 05/05/12. A left-hand ramp quickly follows for I-244 & U.S. 412 west along the north leg of the IDL to connections with Tisdale Parkway and Sand Springs Expressway (U.S. 64 & SH 51) west. U.S. 75 otherwise transitions into the Cherokee Expressway north to suburban areas west of Owasso and Skiatook. Photo taken 05/05/12. Button copy sign signs at the 3rd Street overpass for the adjacent ramps to I-244 & U.S. 412 on I-444 north. Directional tabs were added to these overheads in place of Exits 96B and 96C when they were amended to show U.S. 412. 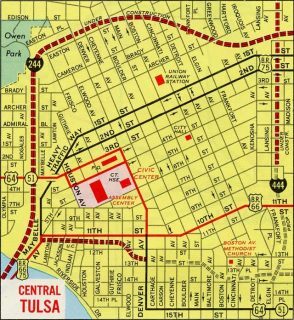 U.S. 412 was designated through Tulsa as part of a long distance extension to Woodward in 1989. Vidcap taken 05/28/95. The subsequent set of button copy signs retained exit tabs formerly for 96B and 96C as U.S. 412 was not added. 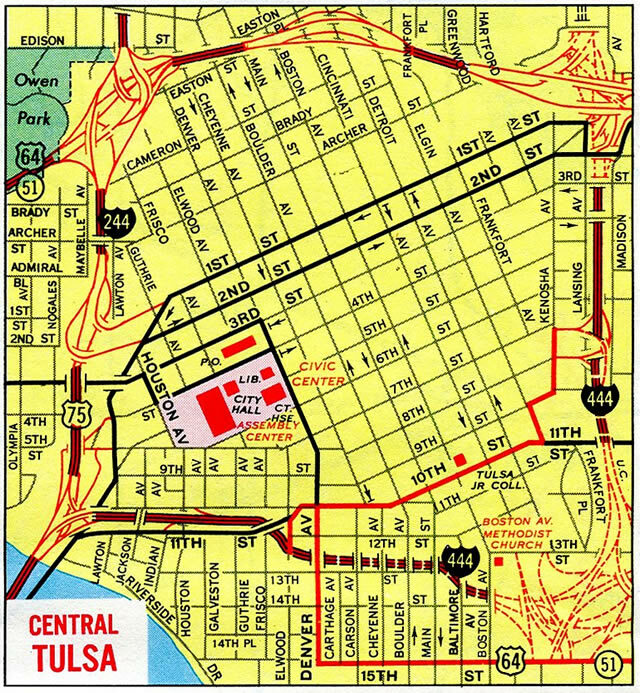 U.S. 412 overlaps with another route throughout the entire Tulsa metropolitan area. Vidcap taken 05/28/95. Signs for old Exit 96C simply displayed Interstate 244 west without a control city. Photo taken by Rick Mattioni (04/01). U.S. 75 (Cherokee Expressway) continued north from I-244, 44 miles to Bartlesville from this set of replaced signs. Photo taken by Rick Mattioni (04/01). Interstate 244 & U.S. 412 reduce to two westbound lanes as back to back two-lane off-ramps depart for U.S. 75 and the IDL (I-444) to the left (Exit 6B) and 1st Street and Downtown to the right (Exit 6C). Photo taken 11/02/16. Exit 6B separates from I-244 & U.S. 412 west for U.S. 75 north toward Bartlesville and the east leg of the IDL (I-444) south to the Broken Arrow Expressway (U.S. 64 & SH 51). Photo taken 11/02/16. Interstate 244 & U.S. 412 tie into the northeast corner of Tulsa’s Inner Dispersal Loop (IDL), where U.S. 75 travels south from the Cherokee Expressway to combine with unsigned Interstate 444 around the central business district. Photo taken 11/02/16. Monotube sign bridges were installed along I-244 leading west toward the IDL (I-444) and U.S. 75 (Cherokee Expressway) by fall 2015 as part of the reconstruction of I-244 between March 2015 and summer 2016. Photo taken by Eric Stuve (12/01/02). Looking at Interstate 244 west at the left-hand ramps for U.S. 75 and unsigned I-444 well before the modernization of the freeway leading toward Downtown. Photo taken by Eric Stuve (12/01/02). Interstate 244 & U.S. 412 eastbound elevate onto a viaduct across the directional T interchanges linking the freeway with U.S. 75 north to Bartlesville and I-444 & U.S. 75 south to Midtown. Photo taken 11/01/16. Exit 6B separates into single lane ramps for the IDL south and U.S. 75 (Cherokee Expressway) north. Photo taken 11/01/16. Highway Gothic font based signs for unsigned I-444 south and U.S. 75 (Cherokee Expressway) at the left-hand ramp for Exit 6B from I-244 & U.S. 412 east. Photo taken by Rick Mattioni (09/00). The initial sign for Interstate 244 along the IDL westbound appears at the South Denver Avenue overpass. The last mainline exit departs in 0.25 miles for parallel 11th Street and Houston Avenue north to Cox Business (Convention) Center. Photo taken 11/01/16. The unnumbered directional T interchange between I-244 and I-444 lies at the southwest end of Downtown Tulsa between the Arkansas River and adjacent BNSF Railroad tracks. Photo taken 11/01/16. Interstate 244 west & U.S. 75 south overlap across the Arkansas River to split on separate freeways to Sapulpa and Jenks. U.S. 64 & SH 51 branch west from I-244 nearby along the Sand Springs Expressway. Photo taken by Martin McMahon (08/03). Replaced button copy overheads posted as I-444 south, U.S. 64-SH 51 west and U.S. 75 south passed over Houston Avenue on the approach to Interstate 244. The exit tabs formerly displaying Exits 94A/B were dropped from sign replacements made by summer 2003. Photo taken by Rick Mattioni (09/00). Westbound on Interstate 444 at the ramp split to I-244 west & U.S. 75 south to Okmulgee and I-244 east & U.S. 64-SH 51 west to Sand Springs. This set of button copy signs was replaced by summer 2003. Photo taken by Ben Prusia (fall of 2001). Interstate 244 & U.S. 75 span the Arkansas River with six overall lanes on the one mile approach to Exit 4B with the south leg of the Inner Dispersal Loop (IDL). Photo taken 11/02/16. Construction started in April 2011 replaced the westbound span of I-244 across the Arkansas River. The eastbound span was restriped to accommodate two-way traffic until the new bridge opened in December 2012. This set of signs for unsigned I-444 east (Exit 4B) and 7th Street (Exit 4C) was carbon copied on the new eastbound span. The new crossing opened to traffic on June 7, 2013. Photo taken 11/02/16. U.S. 75 splits with I-244 to join U.S. 64 & Oklahoma 51 east and unsigned I-444 north to the Cherokee Expressway. U.S. 64 & Oklahoma 51 west follow I-244 north for three quarters of a mile to the Sand Springs Expressway west. Photo taken 11/02/16. New signs installed during summer 2003 directed motorists from Interstate 244 (Red Fork Expressway) east to unsigned I-444 (IDL) north. This set of signs was replaced by 2009 to use Clearview font. Photo taken by Martin McMahon (08/03). Entering the directional T interchange (Exit 4B) with unsigned I-444, U.S. 64 & Oklahoma 51 (IDL) on the old Arkansas River bridge. This span was built in 1967 and replaced due to structural deficiencies. Photo taken 05/05/12. A wye interchange (Exit 5A) connects I-244 west & U.S. 64-SH 51 east with 2nd Street and the BOK Center just south of their merge, and one half mile ahead of their split at the IDL (U.S. 75 & I-444). Photo taken 11/02/16. U.S. 64 & SH 51 east combine with U.S. 75 north along the south leg of the IDL to the Broken Arrow Expressway. The two overlap southeast to Mingo Valley Expressway, where U.S. 169 turns south to end at the Creek Turnpike. Photo taken 11/02/16. Exit 4B departs from the left for I-444 along the south side of Downtown. SH 51 joins the central business district with the suburb of Broken Arrow and Muskogee via SH 351 (Muskogee Turnpike). U.S. 75 south meanwhile joins I-244 west for a 2.2 mile overlap to the Okmulgee Expressway. Photo taken 11/02/16. Former button copy signs posted one half mile north of unsigned I-444 by the flyover ramp leading east to 2nd Street. These were replaced by 2002. Vidcap taken 05/28/95. Replacement signs posted for Exit 4B at the 2nd Street flyover. Photo taken by Eric Stuve (12/01/02). The 2010-13 construction project to replace the westbound span across the Arkansas River included a sign replacement of these overheads. Photo taken by Eric Stuve (12/01/02). Side Trips 3: Wherefore Art Thou 94D http://www.tulok.net/s3.html. Roadkahoma (Martin McMahon) – former web site. 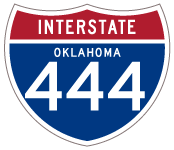 “Despite lack of signage, I-444 exists in Tulsa.” The Oklahoman, November 23, 2009.